Priess sees the ability to deal with an unfit leader as a cornerstone of American democracy. The United States as unique in its “constitutional and political ways of removing presidents without having a bloodbath or a coup.” The existence of formal and informal mechanisms to check the power of unfit presidents is a legacy of a value that was central to the Founders: vigilance against the unjust use of power by those entrusted with it. Done properly and in good faith, the removal of a president who is demonstrably unfit does not create a political crisis: it is a duly-authorized way to end one. As he wrote, Priess came to understand that faced with an unfit president, Americans should not necessarily look to Congress for action: instead, they should look to themselves. The Founders provided the American citizenry with a tool that was revolutionary at the time but has become under-valued: regular elections. There is a “real benefit to having the people decide to move on to the next leader,” even if four years seems like a long time to live with a problematic president. Former FBI head James Comey – a man as entitled as anyone to hold a personal grudge against the current occupant of the White House – has argued that electoral defeat, and not impeachment, is the preferable way to show Donald Trump that the American people do not want him as a leader. In between elections, political advisors can become a significant check on a president who is behaving in ways that are contrary to the national interest; a sitting president who displays questionable judgment may find their authority undermined by staff or Cabinet officials. While this is clearly not supposed to happen, there are enough precedents to demonstrate that the system does empower certain people with the ability to limit a president’s ability to harm the country. When Ulysses Grant served as Secretary of War and Commanding General of the Army under President Andrew Johnson, he limited Johnson’s ability to enact the worst of his racist policies in the Reconstruction South. More recently, Richard Nixon’s aides and Cabinet officials limited his acting out his worst impulses. Priess does not mention the oft-repeated story about how, in the dying days of the Nixon Administration, Secretary of Defense James Schlesinger ordered the men responsible for launching nuclear weapons to verify any launch order that Nixon issued with either him or Secretary of State Henry Kissinger, out of fear that Nixon, who was depressed and drunk much of the time, might do something rash. He does, however, discuss how Nixon advisors, notably Chief of Staff H.R. Haldeman, worked to limit the real-world impact of decisions that the president made in anger; when Nixon ordered the bombing of Damascus with no justification, Haldeman simply did not pass the order along the chain of command. The parallels to the situation in the current administration are obvious: cabinet officials removing documents from Trump’s desk before he could sign them; an anonymous Trump official writing an op-ed claiming that “senior officials in [Trump’s] own administration are working diligently from within to frustrate parts of his agenda and his worst inclinations”; former Chief of Staff John Kelly measuring his success in terms of what he had prevented the president from doing. While reasonable people might be grateful that Nixon was prevented from acting on his worst impulses, this presents serious ethical problems. Haldeman claimed that he had Nixon’s “tacit approval” to override decisions his boss had made without proper reflection, but the record shows that Nixon was sometimes upset at Haldeman’s failure to follow through on his orders. If one person decides on their own to torpedo the president’s policies, no matter how problematic they may be, there is potential for chaos. It’s not a cabinet secretary’s job to undo policy they don’t agree with, it’s their job to argue for a point of view and then execute the president’s (legal) orders. It’s one thing if the president decides to unilaterally nuke France, but when it’s a trade agreement, the answer is not freelance policy decisions on the part of cabinet secretaries or White House aides. If a sitting president is making decisions that bring their sanity or aptitude into question, presidential aides need to employ the tools granted to them by the Constitution. In 1967, the Twenty-Fifth Amendment was adopted, enshrining procedures to address a situation in which a president had been temporarily or permanently incapacitated. The Twenty-Fifth Amendment arose from a bit of counter-factual historical thinking: who would have been in charge if JFK had not died in Dallas, but instead suffered massive brain damage? Briefly put, if the vice-president and half of the cabinet agree that “the president is unable to discharge the powers and duties of his office,” then the president shall be replaced by the vice-president. The Twenty-Fifth Amendment was a product of its Cold War historical context. While there had been historical cases of presidents who had been unable to do their jobs for a time – Ulysses Grant had cancer surgery in secret, and, most famously, Woodrow Wilson was largely incapacitated by a stroke for much of the last two years of his second term, leaving his wife Edith to fulfil his duties – nuclear weapons necessitated a way to ensure that the only person with the authority to launch the nuclear arsenal had the mental and physical capacity to do so if it was deemed necessary. If the Twenty-Fifth Amendment is meant to ensure that the person with command authority is capable of launching the nukes, it raises the question of what to do when a president should, because of their emotional or mental health, no longer have that authority. Priess believes that the Twenty-Fifth Amendment fails to resolve that crucial national security question because it does not clearly define mental incapacity. It’s clear that a comatose president cannot be in charge of the nuclear arsenal, but the amendment is vague on where the line between someone acting erratically and actual mental deficiency should be drawn. This is an issue that needs to be closely examined by mental health experts and cognitive scientists, not only because of the clear emotional and mental health challenges that the current president suffers from, but because in a system where one person literally has the power to extinguish all life on earth, it is paramount that the people can be assured that they are competent to hold that responsibility. Priess believes I’m not sure I agree that impeachment-without-removal remains a powerful way to check an unfit president, or that the Democrats should disregard how the Senate is unlikely to remove Trump from office and launch proceedings to keep him in line. The Clinton impeachment robbed the process of credibility, and we are in a political climate that is far more polarized that in was in 1998. This combination seems to make impeachment-without-removal a political non-starter. Without removal, an impeachment that passes along party lines will only embolden Trump in the eyes of his base; nobody wants to risk empowering Trump by allowing him to claim that he was cleared of all wrongdoing should the Senate fail to remove him. Cabinet secretaries invoking the Twenty-Fifth Amendment or Congress moving to impeach and possibly remove Trump from office not only risk failing, they risk worsening the situation. Combine a process that lacks bipartisan support with a president who excels at enraging a fervid base of supporters, and it’s easy to see how an attempt to remove Trump, even with a solid case, could lead to a political crisis unseen since the Civil War. What would happen if a president who has been duly removed refused to recognize the legitimacy of the process? Who would maintain authority over the nuclear arsenal? The possibility of a duly-removed president splitting the Executive branch into competing camps could theoretically spiral into “essentially a civil war.” Given the extent to which Trump commands a significant number of followers who cling to his every word, it’s impossible to contemplate his removal without taking account the worst possible scenarios. Yet Priess maintains that using the appropriate tools against a morally compromised or clearly incapacitated president “is not a Constitutional crisis, it IS the Constitution.” With all the potential for uncertainty woven into it, Priess argues that history demonstrates that the system works. And largely, he’s correct: only a handful of presidents have been lost to assassination, and these isolated incidents occurred at the hands of individuals, not as organized plots to bring down a government. America has never experienced a coup d’etat. America has endured in part because mechanisms to get rid of bad presidents exist. Next time out, we’ll start looking at how that process began unfolding during the 1972 presidential election. 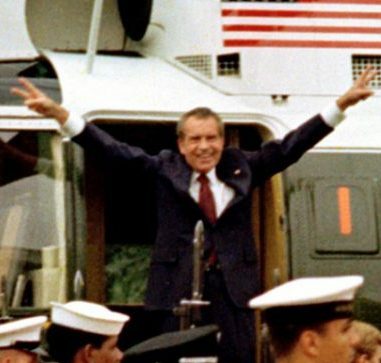 Next ›Watergate: The Presidential Scandal That Shook America. Part I: The Context.